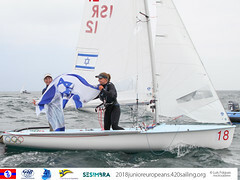 Elise RECHICHI and Tessa PARKINSON (AUS), just 22 and 21 years old respectively, finished third and second in the final two races of the Women’s 470 Opening Series to extend their overall lead to 18-points. That means their closest rivals, Marcelien DE KONING and Lobke BERKHOUT (NED), must put a least eight boats between them and the Aussies (i.e. 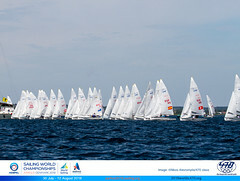 the Dutch win the race and the Australians finish last or fail to finish) to move into the gold medal position. In their current position, the Australians have only one thing on their mind, “We have guaranteed silver, but we won’t be happy with it. 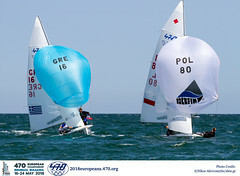 We’re going for gold,” said RECHICHI at the ending of the day’s racing.